Photo © Brian Lawrence / Getty Images. Temperate forests are forests that grow in temperate regions such as those found in eastern North America, western and central Europe, and northeastern Asia. Temperate forests occur at latitudes between about 25° and 50° in both hemispheres. They have a moderate climate and a growing season that lasts between 140 and 200 days each year. Precipitation in temperate forests is generally distributed evenly throughout the year. The canopy of a temperate forest consists mainly of broad-leaved trees. Toward polar regions, temperate forests give way to boreal forests. Temperate forests first evolved about 65 million years ago during the beginning of the Cenozoic Era. At that time, global temperatures dropped and, in areas further from the equator, cooler and more temperate climates emerged. In these regions, temperatures were not only cooler but were also dryer and showed seasonal variations. The plants in these regions evolved and adapted to the climate changes. Today, the temperate forests that are closer to the tropics (and where the climate changed less dramatically), the tree and other plant species more closely resemble those of the older, tropical regions. In these regions, temperate evergreen forests can be found. 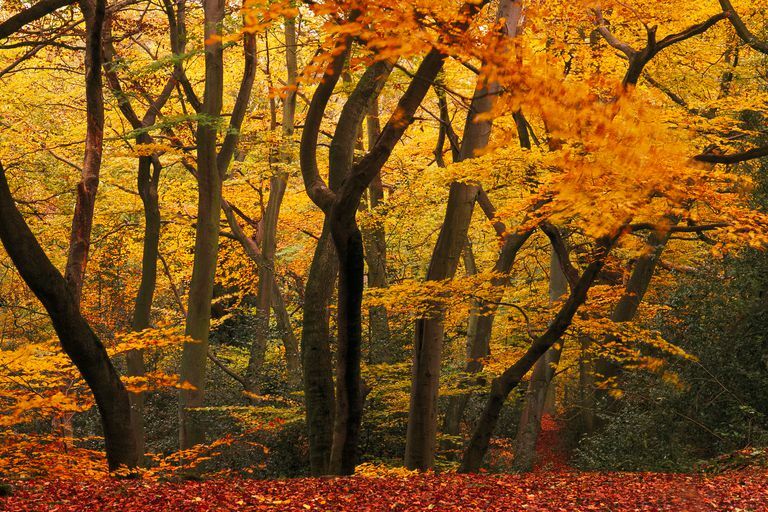 In areas where climate changes were more dramatic, deciduous trees evolved (deciduous trees drop their leaves when the weather turns cold each year as an adaptation that enables trees to withstand the seasonal temperature fluctuations in these regions). Where forests became dryer, sclerophyllous trees evolved to cope with periodic lack of water. Temperate deciduous forests - Temperate deciduous forests occur in eastern North America, central Europe, and parts of Asia. Deciduous forests experience temperatures that range between -30° and 30°C throughout the year. They receive between 75 and 150 cm of rainfall each year. The vegetation of temperate deciduous forest includes a variety of broadleaf trees (such as oak, beech, cherry, maple, and hickory) as well as various shrubs, perennial herbs, mosses, and mushrooms. Temperate deciduous forests occur and mid-latitudes, between the polar regions and the tropics. Temperate evergreen forests - Temperate evergreen forests consist mainly of evergreen trees that retain their leaves throughout the year. Temperate evergreen forests occur in eastern North America and in the Mediterranean Basin. They also include subtropical broadleaf evergreen forests of the southeastern United States, southern China, and southeastern Brazil. Eastern chipmunk (Tamias striatus) - The eastern chipmunk is a species of chipmunk that lives in the deciduous forests of eastern North America. Easter chipmunks are small rodents that have red-brown fur and dark and light brown stripes that run the length of its back. 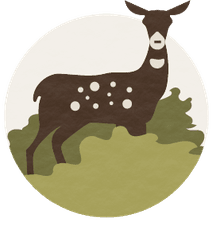 White-tailed deer (Odocoileus virginianus) - The white-tailed deer is a species of deer that inhabits the deciduous forests of eastern North America. White-tailed deer have a brown coat and a tail with a distinct white underside that it raises when alarmed. American black bear (Ursus americanus) - American black bears are one of three bear species that live in North America, the other two being the brown bear and the polar bear. Of these bear species, black bears are the smallest and most timid. European robin (Erithacus rebecula) - European robins are shy birds throughout most of their range but in the British Isles, they have acquired a charming tameness and are frequent, honored guests in backyard gardens, and parks. Their feeding behavior historically involved following foraging animals such as the wild boar as it dug through the soil.